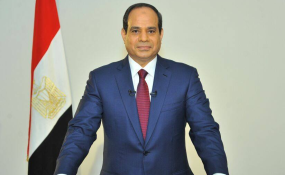 President Abdel Fattah al-Sisi of Egypt made several wrong claims in his appearance on January 6, 2019 on the "60 Minutes" TV show in the United States, Human Rights Watch said today. Among his statements was that the Egyptian government holds no political prisoners, despite documentation that thousands of people have been arbitrarily arrested for their political activity in recent years. Al-Sisi also wrongly stated in the program broadcast on the CBS network that the killings of hundreds of anti-government protesters in Rab'a Square in Cairo in August 2013, which he oversaw as defense minister, were justified because there were "thousands of armed people." "President Al-Sisi's misinformation is laughable, fools no one, and is a poor attempt to conceal serious abuses under his authority, including possible crimes against humanity," said Michael Page, deputy Middle East and North Africa director at Human Rights Watch. "Several of his answers even contradicted the government's own official statements." Al-Sisi sat for an interview with 60 Minutes journalist Scott Pelley several months ago, but the Egyptian Embassy in Washington later requested that 60 Minutes not broadcast the interview, CBS television said. Egyptian authorities also told Egyptian media not to cover the "60 Minutes" interview, the independent news website Mada Masr reported. No major mainstream media in Egypt have yet covered Al-Sisi's "60 Minutes" statements. In response to a question about the Human Rights Watch estimate that at least 60,000 people had been arrested in Egypt on political grounds, Al-Sisi stated, "I don't know where they got that figure. I said there are no political prisoners in Egypt." Since Al-Sisi effectively rose to power in July 2013 after ousting Egypt's first elected president, Mohamed Morsy, Egyptian authorities have arrested and charged tens of thousands of political opponents. A law introduced shortly after Morsy's ouster effectively banned all peaceful protests, and authorities have used it as a justification to arrest and prosecute thousands of protesters. Widespread arbitrary arrests and enforced disappearances have been a hallmark of Al-Sisi's rule. Between Morsy's overthrow and May 2014, the independent Egyptian civil society initiative Wikithawra documented the arrest or prosecution of 41,000 people. In addition, 26,000 more may have been arrested in 2015 and 2016, lawyers and human rights researchers have said. The nationwide crackdown quickly widened to include scores of writers, journalists, artists, and political and human rights defenders for their peaceful criticism. Al-Sisi himself had said in June 2015 that "there are innocents in prisons." He has issued presidential pardons for over 1,100 people, many of whom were arrested during peaceful protests. The Egyptian authorities have released next to nothing on the number of prisoners in the country. But some statements to the media by officials have acknowledged at least 34,000 arrests in relation to the current crackdown. The Egyptian government should publicly provide comprehensive figures about how many prisoners it holds and create an accessible database for families so that they can locate their imprisoned relatives, Human Rights Watch said. The database should also be accessible to lawyers and researchers. The Interior Ministry supervises and runs all prisons in Egypt. However, thousands of detainees, especially those in pretrial detention, are held in police stations and unofficial detention sites. In October 2018, the interior minister's assistant for prison supervision, General Zakaria al-Ghamry, said that over 115,000 prisoners have been released since 2014. In May 2015, the government-sponsored National Council for Human Rights said in a report that prisons were 160 percent over capacity and police stations 300 percent over in the months following Morsy's ouster. The overcrowding and poor detention conditions led to a "rash" of deaths in custody that Human Rights Watch documented. In the "60 Minutes" interview, Al-Sisi also denied any wrongdoing for the systematic and widespread killing of largely peaceful protesters in Rab'a Square in August 2013 that he personally supervised as defense minister. In one day, security forces killed at least 817 people when they violently dispersed tens of thousands of pro-Morsy demonstrators who gathered to protest his forced removal by the army. The incident was the biggest mass killing of protesters in Egypt's history and one of the largest in the world in recent decades, and the killings probably amount to crimes against humanity. Security forces also engaged in several other incidents of mass killings of protesters before and after the Rab'a sit-in dispersal. Al-Sisi's said in the interview that thousands of protesters were armed during the Rab'a Square dispersal, which contradicts findings by Human Rights Watch. The claim also contradicts official statements by the Interior Ministry, which said it seized only 15 guns from the Raba'a protesters. Several years later, in an unfair mass trial of over 730 Rab'a protesters and Muslim Brotherhood leaders, authorities presented only 13 rifles and 36 birdshot guns as evidence. In addition, several official statements and reports accused the police of using excessive force. The former prime minister who supervised the dispersal, Hazem al-Beblawy, said in 2014 that "anyone who committed a mistake ... should be investigated." An official government fact-finding report on the Rab'a Square dispersal, whose summary was published in November 2014, largely blamed the protesters for violence and casualties but also admitted that security forces failed to target only people who were armed. "The president's words are contradicted by the facts, from the Rab'a Square killings, to the number of journalists in prison today for simply doing their job," Page said. "Al-Sisi's blatant attempt at misinformation cannot stand up to the simplest scrutiny."